Responding to President Donald Trump’s executive order banning entry of travelers from certain Middle Eastern countries, the president and vice president of the United States Conference of Catholic Bishops, Cardinal Daniel DiNardo of Houston and Archbishop Jose Gomez of Los Angeles, issued a statement on the issue Monday, Jan. 30. The president’s order suspends the entry of refugees into the United States for 120 days, indefinitely halts the admission of Syrian refugees and bars individuals from seven predominantly Muslim countries for 90 days. 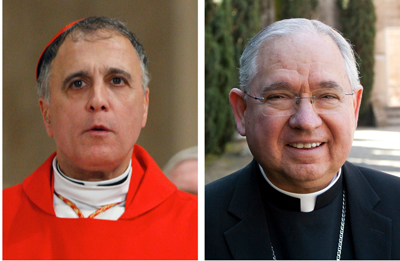 Cardinal DiNardo and Archbishop Gomez were grateful for the many U.S. bishops who have spoken out “in defense of God’s people” since President Trump announced the ban Jan. 27. “Now, we call upon all the Catholic faithful to join us as we unite our voices with all who speak in defense of human dignity,” they said. “The actions of our government must remind people of basic humanity. Where our brothers and sisters suffer rejection and abandonment we will lift our voice on their behalf. We will welcome them and receive them. They are Jesus and the church will not turn away from him. “Our desire is not to enter the political arena, but rather to proclaim Christ alive in the world today. In the very moment a family abandons their home under threat of death, Jesus is present. And he says to each of us, ‘whatever you did for one of these least brothers of mine, you did for me'” (Mt. 25:40).